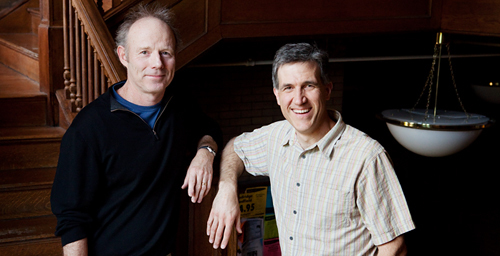 In The Atlas of World Hunger, University of Illinois geography professor Thomas Bassett (left) and Illinois agricultural and consumer economics professor Alex Winter-Nelson, developed a new method for assessing hunger. CHAMPAIGN, Ill. - World hunger is often seen as the result of overpopulation, bad geography or natural or human-made disasters. But a new book, "The Atlas of World Hunger," reveals that the contours and causes of hunger are more complex - and in some ways more easily addressed - than those old assumptions suggest. The new Hunger Vulnerability Index, developed by the authors of The Atlas of World Hunger, captures those who are hungry as well as those at risk of falling into hunger. Its authors, University of Illinois geography professor Thomas Bassett and Illinois agricultural and consumer economics professor Alex Winter-Nelson, developed a new method for assessing hunger. Their Hunger Vulnerability Index (HVI) locates the hungry as well as those at risk of falling into hunger. The HVI is made up of three components that reflect the public and private dimensions of hunger: the availability of food at the national level, measured in calories available per capita per day; household access to that food, which is tied to household income; and the nutritional status of individuals - as reflected in specific health measures, such as growth failure in young children. The authors developed the HVI because other assessments of world hunger, most notably the United Nations Food and Agricultural Organization's Prevalence of Undernourishment (POU) index, overlooked some regions that were clearly suffering the effects of hunger. The FAO's index also failed to identify some populations that were at high risk of hunger, the authors report. "One of the things that was really striking to me early when we were doing this mapping was discovering that the POU was showing no problems in places where child malnourishment and child stunting were tremendous problems," Winter-Nelson said. "That is really what motivated us to come up with the HVI." The HVI uses a higher threshold of poverty than most other assessments, allowing it to capture those at risk of becoming hungry, he said. "The common idea is if you're living on less than can be purchased in the U.S. for $1.25 in a day, you're extremely poor," Winter-Nelson said. "People under that threshold are almost certainly suffering from hunger and will often be victims of early death because of their poverty. In our analysis, we took a higher threshold of $2 a day to try to capture people who are at risk of falling into that kind of extreme poverty." The authors looked at a host of factors side by side with the HVI map, to see which variables were most closely associated with hunger vulnerability. Their findings contradict some common assumptions, like the notion that population growth drives hunger. "Maps are tools to interrogate the problem," Bassett said. "So, for example, we look at population growth rates around the world and we show that there actually is no strong relationship between population growth and hunger." The authors also take issue with the idea that wars and natural disasters are a primary cause of hunger. "For us, natural or human-made disasters are exacerbating events that push people into hunger because they are already vulnerable," Bassett said. Drought, for example, does not lead to famine if people "have the resources to cope with disaster," he said. Of all the factors that influence hunger, access to resources - physical, economic, political and social - is key, the authors report. "The roots of hunger are tangled and complex, but hunger is always closely tied to poverty and social vulnerability," they wrote. "We emphasize poverty and entitlement failure as the most important underlying causes of hunger." The authors also make a more encouraging observation. 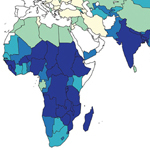 They found that regions with high literacy, gender equality, access to health-care services and to technology tend to have lower rates of hunger and hunger vulnerability than other regions. Literacy and access to technology have an obvious impact on hunger, Bassett said, because they enhance an individual's ability to earn enough money to eat well. Other less obvious factors, such as gender equality, also play a significant role in mediating hunger. "Where gender inequalities are high, hunger vulnerability tends to be high," Bassett said. "That's linked to the fact that women take care of children. And if women's status is low - that is, if their incomes are low - they have little power in the household in decision-making around how money is spent. That's a sign that children are probably going to suffer because women are suffering." "The Atlas of World Hunger" (University of Chicago Press) provides a new window on hunger, the authors say, showing for the first time the true extent of hunger vulnerability and revealing which efforts to reduce hunger will likely be most fruitful. Editor's note: To contact Thomas Bassett, e-mail bassett@illinois.edu. To reach Alex Winter-Nelson, call 217-244-1381; e-mail alexwn@illinois.edu.